Understanding the economic impact and animal welfare aspects of antimicrobial resistance in the food chain. ILSI Europe is involved as a dissemination partner via its Microbiological Food Safety Task Force. A literature review was conducted to determine the conditions to which bacteria are subjected throughout the food chain. Finalised in April 2014, the review highlighted antibiotic resistant pathogen phenotypes behaving differently from antibiotic-sensitive food pathogens when subjected to various biophysical processes. The results were integrated in the research of the project. The experts are currently drafting a manuscript summarising their findings for submission in a peer-reviewed journal. This draft manuscript, entitled ‘Biophysical Parameters Affecting Gene Transfer in the Food Chain’, was presented at the International Association of Food Protection (IAFP) European Symposium on Food Safety 2016 (12 May 2016, Athens, Greece). The purpose of this session was to give an overview of the problem of antimicrobial resistance in the food chain from a tripartite perspective. In addition, ILSI Europe develops specific communication material such as the project newsletters. ILSI Europe is in charge of organising presentations at international symposia such as the IAFP European Symposia on Food Safety in 2015 and 2016. Finally, ILSI Europe is taking the lead in organising the final conference of the project which is envisioned to be held in autumn 2018 in the Netherlands. This conference will be used to disseminate EFFORT’s output to relevant stakeholders. Through its results, the EFFORT project will provide scientific evidence and high quality data that will inform decision-makers, the scientific community and other stakeholders about the consequences of AMR in the food chain, in relation to animal health and welfare, food safety and economic aspects. These results can be used to support decisions and to prioritise risk management options along the food chain. 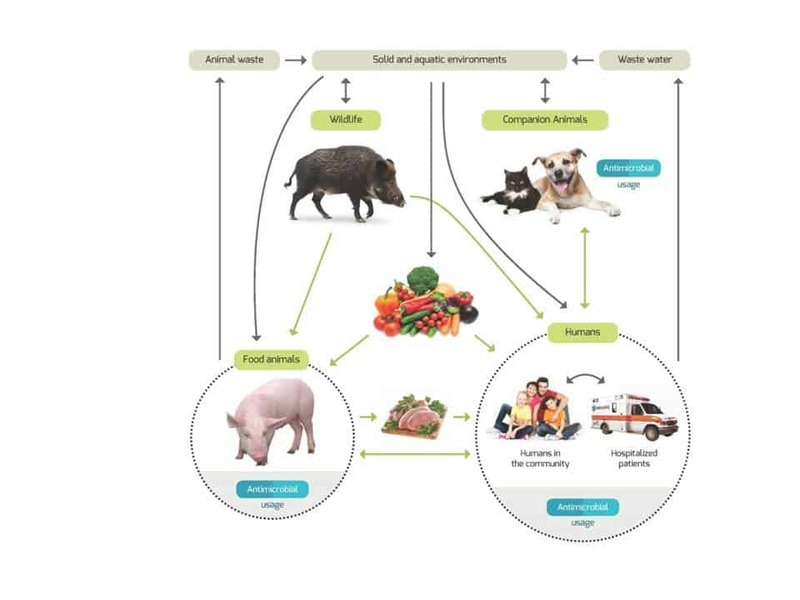 Different exposure pathways showing how antimicrobial resistance can emerge in food-producing animals, the (farm) environment and food of animal origin as well as via companion animals and wildlife. What is the impact of antimicrobial usage in food-producing animals on human exposure to AMR determinants? What are the most important transmission routes and sources of human exposure to AMR determinants? What is the impact on human health of transfer of AMR determinants between commensals and pathogenic microorganisms? How can human exposure to AMR determinants via food-producing animals be reduced? What is the most cost-effective way of monitoring antimicrobial resistance occurrence in food-producing animals and in the food chain? For more detailed information, please contact Dr Tobias Recker at trecker@ilsieurope.be or Mr Elias Rito at erito@ilsieurope.be.